If you are involved in music education in Islington, don’t miss out on the opportunity to contribute to a new music education strategy for the borough! 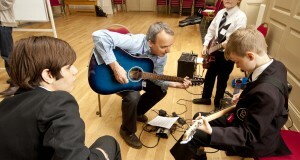 Here at Sound Connections we are in the research phase of creating a new strategy for music education in Islington. Having met with a fascinating variety of organisations and individuals at our first roundtable discussion in February, we’re looking forward to meeting others at the next discussion on Thursday 17 March, 4-6.30pm at Arts and Media Islington. The event is an opportunity for anyone interested in the future of music education in Islington to contribute knowledge, ideas and suggestions in an open forum. The Islington Music Education Strategy is funded by Islington Council and Dame Alice Owen Foundation in partnership with Arts First.